No qualms with him besides potential power level. He's Kaemon Awa with a bonding screen of Warriors of Ashra, for 35 points more. He seems a bit strong with that comparison in mind, but I'm willing to give it a look. A good name, and a nice looking custom. to review. Lynovas is either Kaemon Awa beefed up with a free WoA screen, or he's a blatant WoA booster. Neither is a good idea for the canon. to review. Last edited by capsocrates; April 27th, 2013 at 11:54 PM. Reason: Clarification: There are some units I'm not "interested in" that I would vote to review. This is not one of them. Most of the Lynovas design is ok, but the Merciful personality really bugs me. I don't see how it fits a Satyr, a Guard, or someone that will be tearing armies apart with Quick Release Special Attack. I'm assuming it's a back story thing like Q10; what is the backstory that justifies it? I'm not all too keen on a 'free' WoA screen for 'Kaemon Awa' and he gets all the Guard boosts to go with it. to review Lynovas. 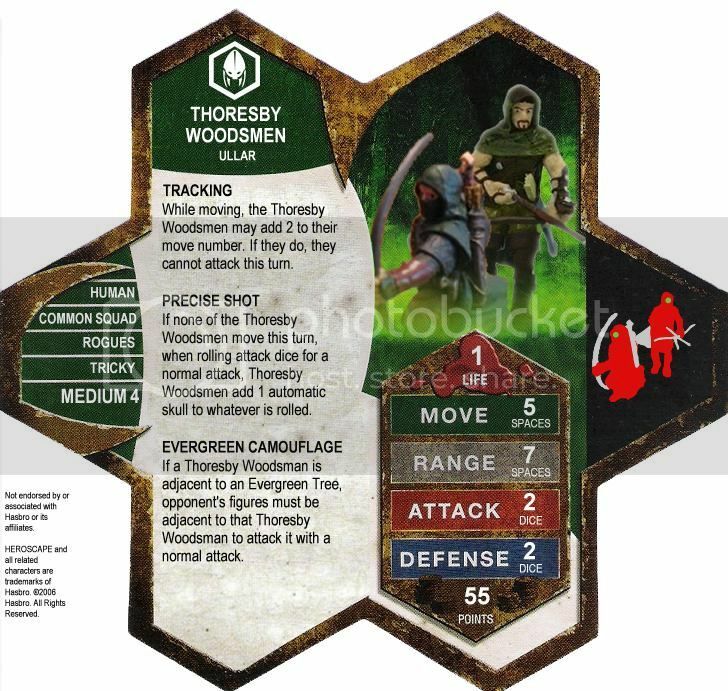 Kantono Daishi and the Thoresby Woodsmen have passed the unified fanscape evaluation and will continue in the test phase. Since nothing has changed there's no need to rehash my thoughts on Daishi. I vote Yes to induct Daishi into the SoV. My previous review is below--aside from the change in general, most of my concerns are unaddressed by the new version. Although I'm very happy to see Kantono Daishi following Vydar rather than Valkrill, there are still a few gameplay issues that niggle at me. I vote NAY to induct Kantono Daishi into the SoV. Dashi is a fun, creative master-ninja by qt.bangerang that gives the ninjas some more playing time. When I sat down to play Dashi, the first thing that leaped out at me was the lack of a distance restriction on his command ability. I was concerned that it would give him too much of an advantage on open fields. While it does prove to be an advantage on open fields, it is not broken and it is actually very thematic--why should a Ninja Master need to be close to his Ninjas to command them? My other concern, the precedence of the power, was easily assuaged by Kato Katsuro's similarly phrased power with no distance restriction. Ultimately I found Dashi to be pretty balanced at 120 points. I couldn't find a build or matchup that I thought made him broken. For more of my thoughts on his balance, see the Playability section. Overall I like Dashi's theme. Phantom Walk is a given, of course, and in play he works very much like a ninja master should--darting in and out of the shadows to direct his ninjalings. His backstory as one of the originators of Ninjutsu who was a dishonored Samurai explains one of his power names as well as his use of Counterstrike. Nonetheless, the latter power does give me pause for non-thematic reasons. I don't like it that he's a human that follows Valkrill, but if anyone is going to do it, it makes sense that a master of honorless assassins would. Dashi has a creative set of powers and brings a unique playstyle to the game-table. I also like how well the miniature choice fits him. I thoroughly enjoyed playing Dashi. He was a lot of fun and required above-average strategy and at-least-average luck. I mainly played Dashi with Kumiko, Shiori, and Isamu, often using the Ninjas of the Northern Wind and/or Otonashi to fill out the army, or in the case of the former to give the army more punch. I enjoyed using Moriko, but in general she is still overpriced--she is not the most efficient 110 points for a ninja-army. My best luck using this army was with an extra component to either beef them up, do some opening damage, or for cleanup--in one game the Krav took out half the opponent's army before Dashi had a single activation. I tried Raelin, the Airborne Elite, the Krav Maga, and Major Q10, just to name a handful. I found those combos to be effective, although the aforementioned units were rarely as effective as they would be in an army more suited to them. With that said, I suspect that a skilled and lucky player could take Dashi, Kumiko, Shiori, Isamu and cheesy-bacon to a tournament and perform well. Dashi really makes Kumiko and Shiori shine. While they both live, the Ninja army has quite a punch. Kumiko can often shred through multiple squad figures, even if they are separated. Shiori is the only ninja with range and her Concentrated Will makes her a solid 4/4; although she is often able to get height to become 5/5. Once either one of those two ninjas goes down, the house of cards begins to tumble, and when they're both gone the ninjas are just about done for. Almost. With 4 life, 5 defense, and Counterstrike, Dashi can be very resilient. For most armies he is not too hard to crack, but against some armies if the ninjas are played well and have a little luck he can sometimes find himself at full life against a number of melee squad figures. All he has to do at that point is grab height, await their attacks, and hope for halfway decent luck. Sometimes it works for him and sometimes it doesn't. I like almost everything about Dashi and I loved playing him. At the same time, there are things about him that make me uncomfortable. I previously mentioned that I don't like him being a human that follows Valkrill. His leadership breaks precedent by letting him take a full turn before activating his companions. He is also a little tougher for melee squads to take down than previous commander types. Kato is tough, with 4 defense and 5 life, and he has teeth with 4 attack, but once his minions are gone he has only that one attack per turn and melee squads can overwhelm him. Kurrock and Ulginesh both have 5 life and only 3 defense, and none of the commander types have any extra defensive abilities. In that way, Dashi breaks not one precedent, but two. When taken altogether, I feel like Dashi has just a little bit too much going on. 5-defense Counterstrike adds "end-game cleanup" to his already useful and effective role as a double-activation commander figure. Even though my playtests showed that Dashi was definitely not broken at his point value with any army-build that I could find, I still felt uncomfortable with the number of games that came down to Dashi winning via Counterstrike. Combined with my dislike of a Valkrill human, I just don't feel comfortable adding him to the canon. I am almost certain that the remaining judge, nyys, will disagree with me, but nonetheless I vote NAY to induct Dashi Tokainto into the SoV. I feel like your old concerns do not hold as much weight. 1) Humans and Valkrill don't mix: we now have the Nhah Scirh Cultists. They may be Icarians, but I see them as humans on another planet. they are definitely humanoid and unless I missed something in the back story, I see them as virtually the same thing. 2) Dashi is too powerful as an end game commander: You use Ulginesh and Kurrock as your examples, but you neglect to compare him to Kato and the newly released Deathcommander Mark 3. If I was to choose a better end game commander I would definitely go with a ranged figure with a special attack, than a figure with counterstrike. I respect your opinion, but feel that you are ignoring newly released and now canonical figures. As far as Valkrill is concerned, I have come around a little--I might be able to see a really crazy, chaotic human following Valkrill. Maybe. But the Icarians don't affect my opinion at all--they're not human, and although they are humanoid, they are obviously pretty weird. I am not ignoring Kato or Deathcommander Mark 3. I have actually thought about (and even discussed elsewhere, privately), both of them. Although Kato is a sturdy 4/4 with 5 life, he does not have Counterstrike and he is 200 points. Deathcommander Mark 3 is only a semi-commander--he does not activate more than one other army card, so he is really more like a gimmicky bonding hero than a commander. I might be the only person who defines a "commander" as a figure that can activate at least two other Army Cards, but that's how I was defining it for this conversation. For the sake of argument, we'll pretend that DCM3 is the same kind of commander as Daishi, though. I'll agree that DCM3 has a lot of advantages over Daishi. That ranged special multi-attack is pretty good. He also has a fair degree of complexity creep (some might say he has too much complexity creep). I appreciate the relative simplicity of Daishi's powers in comparison to a figure like DCM3. My concern with Daishi's end-game cleanup effectiveness have to do with a very specific scenario that does not always come up--the endgame against melee figures with lower attacks (typically squad figures, which also have only 1 life) where Daishi can Phantom Walk his way to the highest ground and make them come attack his 6def + counterstrike. As I believe I said in my review, I don't think it's game breaking, but I would prefer it to be watered down a bit before adding him to the canon. My personal opinion is that the design would be much more interesting with 3 attack and 4 defense. That would slightly ameliorate my endgame concerns while also providing some incentive to occasionally risk a melee attack using Daishi. But that's just one way of addressing it. Thanks for your post, Tiranx. Nice post caps. Those a good valid points. +rep for all that you do for the custom projects.